Over the years, we have explored several times why our obsession with cleanliness only makes us more vulnerable to infectious disease. And today, we're going to learn about new research that indicates it may also make the youngest and most innocent among us more vulnerable to cancer as well. And the problem is only getting worse. Although, childhood cancers are "statistically" rare--representing between 0.5% and 4.6%--that still works out to 15,700 kids (ages 0-19) who get cancer each year in the US.1 Worldwide, the numbers range from 50-200 million new cases each year for children. Across all ages of children and across all ethnic and socio-economic groups, cancer is the number one cause of death by disease in children. And while it is true that the overall survival rate has climbed from a mere 10 percent just fifty years ago to nearly 83 percent today,2 for many rare cancers, the survival rate is much lower and has changed little over the years. Professor Mel Greaves, who recently won the Royal Society's prestigious Royal Medal, says that acute lymphoblastic leukemia cancer (again, the most common form of the most common cancer in children) is caused by a combination of genetic mutations and a lack of childhood infection. To be sure, some of his claims fall under the "to a hammer, everything looks like a nail" umbrella. But the core claim, as just stated, does not and is worth exploring in more detail. First, in utero genetic mutations occur in the fetus. "Childhood ALL [and in effect, all cancers] can be viewed as a paradoxical consequence of progress in modern societies, where behavioral changes have restrained early microbial exposure. This engenders an evolutionary mismatch between historical adaptations of the immune system and contemporary lifestyles. Childhood ALL may be a preventable cancer." Or to put that in American English: clean modern homes, antiseptic wipes, and the obsessive desire to protect babies against any infections play a key role in the onset of the most common form of childhood cancer. In fact, statistically, according to Greaves, one in 20 children is born with a genetic mutation that puts them potentially at risk. But they will be fine if their immune system is properly ramped up through exposure to bacteria and viruses in their first year of life. But remember, Greaves poses a dual role for infections. And that is that for those children whose immune systems are not fully functioning because they never had an early challenge--necessary for strengthening and training--they are now susceptible to that deadly second genetic mutation that can trigger ALL cancer when they are exposed to even an insignificant infection like a cold or a flu later in their childhood. In support of his theory, Greaves points out that ALL is increasing globally at the rate of about 1% a year--and that increase is almost exclusively in affluent populations. ALL rates are low or non-existent in the poorest countries where exposure to dirt is the norm while growing up and where families have lots of children and cross-infection is common. For Greaves, the answer is obvious: "Infectious disease tracks with poverty…The problem is not infection. The problem is lack of infection." In other words, the more infectious disease a child is exposed to early in life, the less likely they are to get childhood cancer. As a side note, Greaves points out that similar trends can be seen in children with type 1 diabetes, Hodgkin's lymphoma, multiple sclerosis and allergies. Being born via a vaginal delivery, which exposes them to vaginal bacteria, rather than a more sterile caesarean delivery. Professor Greaves theory found support in a study published in April of 2018 in Cancer Medicine.9 In fact, the researchers even cited Greaves in their study summary, stating, "The findings of these large pooled and meta-analyses add additional evidence to the hypothesis that regular contact with animals in early childhood is inversely associated with childhood ALL occurrence which is consistent with Greaves' delayed infection hypothesis." More specifically, they stated that contact with livestock in the first year of life was inversely associated with ALL and that inverse associations were also observed for contact with dogs and cats in the first year of life. None of this should be a surprise to readers of this newsletter. I've been saying for over a quarter of a century (yes, it really has been that long), that cancer is fundamentally a disease of the immune system that takes root when your exposure to contaminants gets too high, or the strength of your immune system drops too low. The studies we've talked about today, of course, are an example of the latter. To be clear, your immune system doesn't cause cancer, but it does protect you from it. As I've explained in previous reports, as part of the normal metabolic process, you produce anywhere from a few hundred to as many as 10,000 cancerous cells each and every day of your life. If your immune system is functioning properly, it can recognize each and every one of those aberrant cells and remove them from your body and destroy them. The reason that everybody doesn't get cancer is because their immune systems can do that. That's just what a healthy immune system does. According to the National Cancer Institute's (NCI)'s description of cancer and immunity, when normal cells turn into cancer cells, some of the antigens on their surface change. These cells, like many body cells, constantly shed bits of protein from their surface into the circulatory system. Often, tumor antigens are among the shed proteins. These shed antigens prompt action from immune defenders, including cytotoxic T cells, natural killer cells, and macrophages. As the NCI theorizes, patrolling cells of the immune system provide continuous body wide surveillance, catching and eliminating cells that undergo malignant transformation. Tumors develop when this immune surveillance breaks down or is overwhelmed. And the problem with tumors is that once they start to develop, they also develop the ability to hide from your immune system. What we learned today is that exposure to germs during birth and in your very early years is fundamental to training your immune system--to optimizing it. 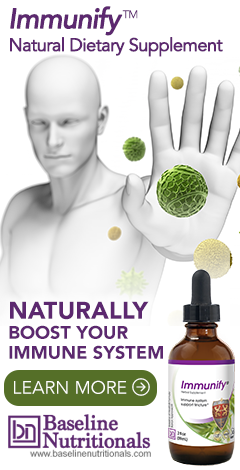 Without that exposure, you're functioning with a diminished immune system. Thus, your chances of having one of those aberrant cells take root and develop into a tumor--or acute lymphoblastic leukemia as seen in the recent studies--notably increase. But again, this shouldn't be a surprise to any of our regular readers. Exposure to germs trains your immune system and causes it to build defenses in response to that exposure. Germophobes like Howard Hughes10 have it wrong. Avoiding all contact with germs doesn't protect you--or your children for that matter--from illness; it weakens you. Although it may lessen your chances of getting a particular cold or flu, it makes it more likely that when you inevitably come down with those illnesses, they will strike you with far more devastating consequences because your immune system will be totally unprepared. Incidentally, the same holds true in the world of plants. If you look at antioxidants, which are what plants use to defend themselves against insects and pathogens, you will notice a huge difference between conventional and organic produce. To put it simply, if you're dousing plants with herbicides and pesticides that eliminate all potential threats, then the plants have nothing to defend against since the toxic chemicals do it for them. As a result, they cut back on their own production of antioxidants since they are no longer necessary. It's simple conservation of energy. Foods fresh harvested from the ground or stalk as opposed to scrubbed and sterilized for sale in the supermarket are loaded with soil-based probiotics that help build immune function. Super clean produce does not provide that benefit. The use of antibacterial soaps destroys the beneficial bacteria on your skin which serve as your first line of defense against pathogens such as flesh-eating bacteria. In fact, 33% people have some level of staph colonization on their skin as is,12 but the MRSA bacteria are held in check by the presence of beneficial bacteria, which keep the MRSA from growing into a devastating flesh eating infection. How effective is that protection? Only 1% develop into actual MRSA infections. In other words, your odds of getting a devastating MRSA infection increase the more you use antibacterial soaps. In fact, even the very presence of triclosan increases your risk of infection.13 When you wash, just use regular soap and water. The bottom line is: being obsessed with cleanliness only makes you more vulnerable to infection--and as we've now learned, most likely to cancer as well…especially childhood cancer. Simple cleanliness with soap and water is more than enough to keep you clean. Avoid using antibacterial soaps, which harm your health and compromise your immune system. And keep that in mind when cleaning and bathing your children. Regular soap and water will do the trick. And don't obsess about a little dirt on their hands. Remember, exposure to a little dirt only makes them stronger. Where are the vaccinations in this entire debate? My question exactly. I managed to play with animals eat dirt and live outside in my childhood. I was not vaccinated until I went to public school at 6 y/o. I got both mumps and chicken pox. My parents didn't know better in the early 60's. Maybe their neglect will protect. We'll see. I suppose that is a good theory. I have never been a clean freak, and enjoyed watching my kids get dirty. I too would get dirty with them. We were a poor military family, not affluent. Yet at two and a half years of age my son was diagnosed with leukemia, specifically ALL. My husband seemed to think that our son was conceived during a time when my husband was sick. But there are so many things it could be. I think this germ phobia solution is simplified, but good information for general well-being. BTW, our son did go into remission, but at nearly 37 years old died from a brain tumor. I agree with you Jon, That's why I am against pasteurization of milk. I grew up on raw milk, and now at 90 I still drink kefir from raw milk mixed 50/50 with coconut milk. I have the same question as Chirstine. I also have a theory, that in the womb, the toxics from the parents, which includes the sperm for the fertilization of the egg could be toxic, as well as both already have immune disfyunctions which are passed into the fetus.especially now with all the poison food they already have!